Does your project need a little more umph than our wall wart adapters can supply? Why not give this a shot? This 2A "laptop brick" supply outputs both 5V and 12VDC and is terminated with a 4-pin Molex connector. To plug the brick into the wall you'll need an IEC C13 cable. You know, the AC cable from your computer or your guitar amp, don't worry we sell them too, check the related items. 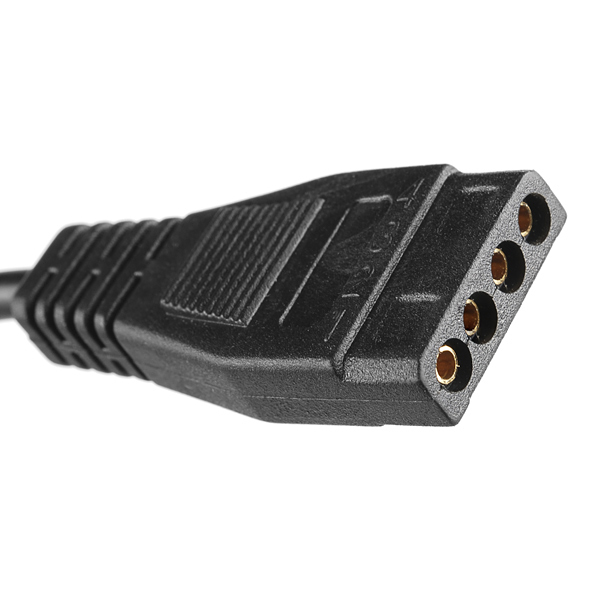 The mating connector is part #: WM6988-ND. We don't sell it but it's commonly found. Note: Only the pin next to 5V is grounded. The pin next to 12V is not connected (NC). Please refer to the picture of the bottom of the unit for more information. Also the AC cable isn't included in case you have one laying around or you're outside the US and will need a different mains plug. 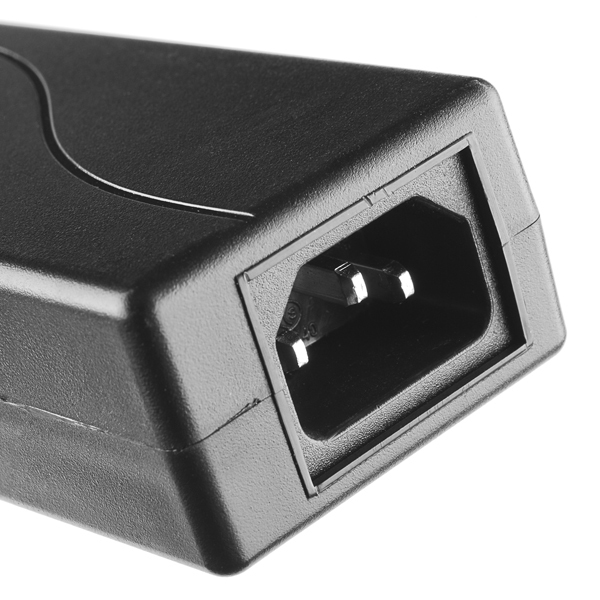 You can try using a terminal block [ https://www.sparkfun.com/products/13061 ] or 2x male DC Barrel Jack Adapters https://www.sparkfun.com/products/10287 for the laptop power supply's output. 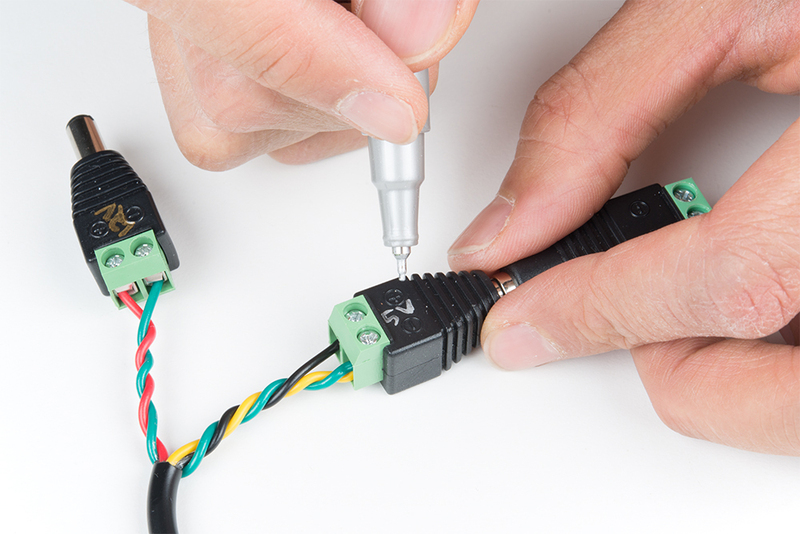 If you are using both 12V and 5V, you may need to strip some wire and connect the GND pins together. Also, make sure that the wire that you are using can handle the amperage [ https://learn.sparkfun.com/tutorials/working-with-wire#wire-thickness ]. 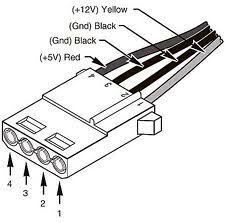 Unfortunately, we do not sell the Molex connector [ https://www.sparkfun.com/products/retired/11300 or https://www.sparkfun.com/products/retired/11297 ] in our catalog anymore. You would need to go to Digi-Key, Mouser, or Newark for the connector. You could also make some sort of adapter and splice the wires together for the output. The power cable [ https://www.sparkfun.com/products/11299 ] for a US wall outlet is sold separately. I cut off the Molex and grabbed a multimeter, and the wires are as follows: Red: +12V Black: +5V Yellow: GND Please correct me if this isn't the case normally! Never buy this. Voltage drops from 5V to 3.5V under less than 1A load. Bought two of these, going to throw away both. DOA. Shoulda paid attention to other comments. I can see how these would burn out disk drives. The rails have to be load balanced in order to maintain the voltage regulation. If they're not, the voltages go way out of spec. So it'd be real easy to brown out or overdrive whatever it's plugged into. Cracking one open, it looks pretty decent inside. It's fully isolated and has the usual safety protection circuitry. There are two big heat sinks that run along the sides of the case, so it would be normal for the case to get pretty hot. It's not waterproof so it's only for dry environment use. Be forewarned. I've used these at work; they came in the box with some USB to IDE/SATA adapters. We ended up throwing away all of them after they fried two disk drives. (15K SAS disks rated at 1.7A 12/5V) These bricks get scorching hot around 1.5A on both rails. Notice there is a distinct lack of certifications like UL and TUV. I'm really curious how these supplies fry disk drives? Is the voltage regulator in them letting more than 12v of power through? I've got the same exact brick that I bought off newegg with a HDD to USB adapter kit and I've used it on many disks without ever having a problem. I'm now needing 12v ~1A for a project I'm working on and the 5V rail is convenient cause another part of my project needs 5v / 3.3v mixed. So I was thinking about using the brick that I got from newegg for it, but I've never used it for extended periods to see the downsides and would rather not see my entire project go up in smoke once I have it in place permanently. If it's just a matter of voltage regulation I'll just be sure to put some extra voltage regulators in my project and maybe some fuses as well to protect from surges. I don't believe the issue is regulation, it would seem the China brands use a cheap version of filter capacitor. I've had one just like this fail that was powering an ext h.d. after being on for 24/7 for about a year. The output caps fail causing poorly filtered DC on the outputs. If you are lucky, the ext HD and board just stop working when the supply fails. If you intend to keep these powered up 24/7, the caps can be replaced with far better ones if you are up to cracking the case open to reveal the parts. Caps would cost about $5.00 from Digikey. Search Lacie supply on youtube for instructions that show how this is done with similar supply. How good is the regulation on this brick? My multimeter measured 6.5 amps output on this guy - and there was a mysterious buzz coming from it. Anyone else observed this? After reading the comments on here, I planned to replace the filter capacitors per Tim's suggestion. That turned out to be a better decision than I had originally thought. Once I opened the supply up (and prior to plugging it in for the first time), I discovered the 12V rail filter capacitor (1000uF, 16V) was already popped. 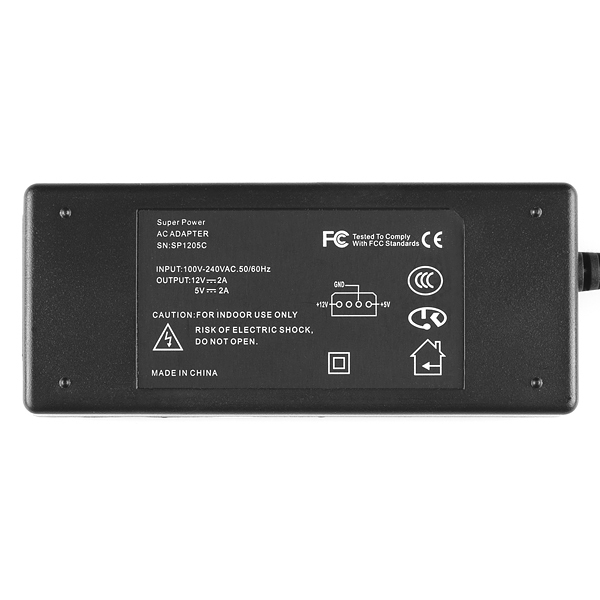 According to Tim, when the power supply is left connected to the mains supply with no load, the 12V rail can rise to 18V and the 5V can go to 8V on a 250V main supply (he's from Australia). These are over the rated voltage for the 12V filter capacitor (probably explaining why it was blown when I got it) and close to the rated voltage of the 5V filter capacitor (1000uF, 10V) respectively. To cover my bases, I'm replacing both with capacitors rated for 25V before I ever plug it in. I'll try to give an update once they arrive and I get them swapped out. Mine works and I love it, so I bought another. It's hooked up like as shown on this forum post. Oh no, maybe it works because I'm feeding it to Arduino stuff with voltage regulators? I think I'm lucky because I didn't confuse the 4 pin molex with "oh use this instead of the PSU in a computer", rather as "oh goody, I can chop wires of computer crap and use this to power my Arduino project!" Thanks to all the hate on here, I'll see what I can do to kill the 2nd one I just bought (because I'm so happy with the 1st one). I'd avoid these for applications with sensitive inputs. I totally agree with above comments on output load balancing - I fried TWO Raspberry Pi Model Bs in the span of 30 minutes with this power supply = NOT HAPPY!!! Also, if you hack apart the cord, you'll find the wire color coding is anything but standard! Is there any chance you will be offering a 4-5A version? Thanks! Mine "popped" within the first 2 minutes of using it. I was only powering a small experiment board using maybe 100 mA. These would be supremely handy if it didn't destroy itself. I live in Europe, it would cost more to send it back than to find another solution. I know your comment is a bit old, but have you contacted customer service? This shouldn't have happened. I'm needing to replace the supply on my USB backup drive. This would do nicely. My only concern is how is the quality? I don't want to fry my backup disk. Gota be careful with something that's powered 24/7 and unsupervised. 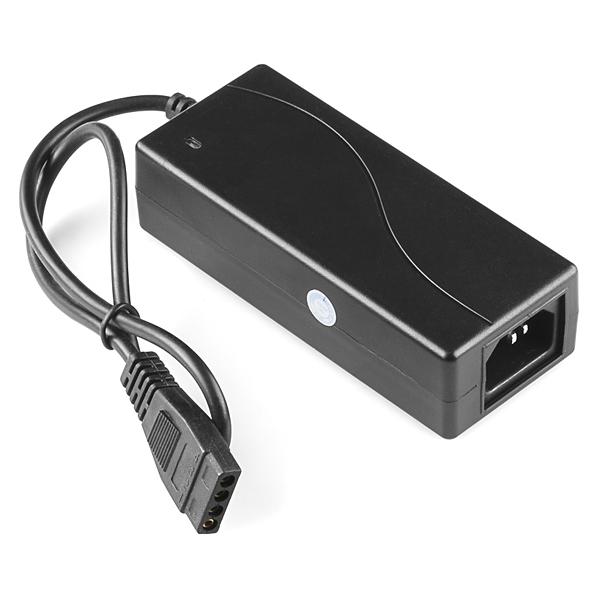 Will this supply enough current to comfortably power a project using the thermal printer you guys sell? wait, If I use 2 of these in parallel will it provide 4 amps? Very good idea. 2A is more than enough for most projects. I'd rather buy one of these than messing up with the computer's power supply. Did your product sourcing amigo do any quality inspection of this device? I have learned to be weary of cheap chargers and other such stuff from China. I buy and resell stuff from China because it's better quality than stuff available to resell that's made in USA. Even wires, which disappointed the patriot in me. I like this. keep getting bigger ones, I wouldn't mind a power supply that can give out 5,9, and 12 volts or 5 amps. Might be worth noting that while "Molex Connector Pinout" shows both center-pins as ground, only one of them is actually ground in this PSU. That seems odd, and very out of spec. I would suggest contacting our tech support team, they should be able to help resolve the issue. Meets my needs but I'm not pulling much current. I just needed 5 and 12 volts in my project. I would have given 5 stars if it wasn't for the short cord. Bought a one from a Chinese supplier that was rated to deliver 2A at 12v/5v - cheaper, but it was junk, shorted out at about 1A. this works great, and as labeled and rated. thanks Sparkfun, a quality supplier.